These are both fairly big zip files so might take a few minutes to download. Sleeps: Each Yurt sleeps up to four adults, or two adults and three children. Tariff: varies from Low Season £50-£70 per night per Yurt, High Season £87.50-£117 per night per Yurt. Units: Four 19′ traditional Mongolian Yurts. 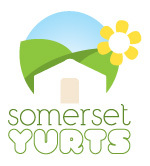 Somerset Yurts is a fantastic eco-friendly retreat nestled on a working Dairy Farm in the beautiful Quantock Hills, an area of outstanding natural beauty (AONB). Providing stunning accommodation in traditional Mongolian Yurts, our site allows couples and families to get back to nature while enjoying a tranquil break from the hustle and bustle of everyday life. The Yurts are luxuriously furnished with Egyptian cotton on your double bed, a power point for charging essential items, a dining area and wood burning stove. For cooking, each Yurt has its own BBQ and gas stove, or you can use our fully equipped kitchen in the communal Dutch Barn where you will also find flushing loos, and hot showers. The yurts are situated on a south facing field, with uninterrupted and far reaching views across Taunton Vale and to the Blackdown Hills, and Exmoor beyond. Our farm is popular both with couples looking for a relaxing retreat in the countryside, as well as with families looking to experience the freedom of the open air, and to let the kids run off all that steam in acres of green fields, and play on the ever popular hay bales! Everyone enjoys toasting marshmallows on the campfire in the yurt field while watching the sun go down over Hestercombe Woods. Somerset Yurts makes an excellent base for you to explore the Quantock Hills, Exmoor, the North Somerset Coast, or just simply sit and relax in your yurt, or on your private yurt deck. A fully equipped kitchen can be found in the Dutch barn – 40 Square meters of space to prepare food, cook, eat, and relax on the sofa and arm chairs. You will also find 4 flushing loo’s and 4 hot power showers in the Dutch Barn, so no queuing to wait your turn, and plenty of hot water for everyone. Each Yurt has a double bed, and a double futon for comfortable and warm sleeping under the stars. We provide an electrical point for the bedside light, and for you to charge your lantern, and any essential items you may have brought with you (although you may be happy to let your mobile run flat as you enjoy the peace and quiet of the countryside!). There is also a lovely woodburner for you to keep nice and toasty with on cooler or damp evenings, and plenty of firewood nearby for you to top up your log basket with.